What the heck does freemartin mean you may be asking? Well it isn’t an event, a cause, or even a person for that matter. It is an agricultural term! 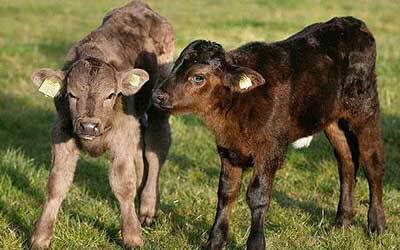 When twin calves are born, and one is a male (bull) and one a female (heifer), the heifer calf is referred to as a freemartin. A freemartin heifer calf is considered over 90% infertile (or sterile), meaning she will probably never be able to have a calf herself. Her reproductive tract may not be fully formed or will be underdeveloped, and she may have some elements of a bull’s reproductive tract! It is important for a cattle producer to know this and keep good records so they can plan to sell her for meat instead of keeping her for breeding purposes. The bull calf will also have reduced fertility. Why does this phenomenon happen? At about the 40th day of pregnancy the fluids of the two fetuses begin to mix, causing exchanges of blood and antigens that are unique to heifers and bulls. When the antigens mix, it causes them to develop characteristics of both sexes! Interestingly, this usually only occurs in cattle, it generally does not affect pigs, goats, sheep, or people! For more information on freemartins, visit: Oklahoma State University or University of Kentucky. Next Alternatives to turkey on Thanksgiving Day?! Our first 4-H bucket calf was a freemartin (although I didn’t know the term!). She was a roan shorthorn mix and a real doll. The kids even rode her! She sounds like she was real sweet!